This recipe is by Susan Scarborough, who made it for the Ultimate Recipe (Cookie!) Challenge. I met Susan few years ago at a cook-off in Chicago where we were allowed to bring one person. I brought my dad and Susan brought her gorgeous twenty-something daughter Amber. The day of the cook-off, Amber hung out in the kitchen, but she didn’t just watch. She was cheery, consoling when things got rough and volunteered to eat the scraps of my frightful “test batch” of peanut butter lava cakes. At that point, I had the greatest admiration for Susan for bringing up such a good kid. Susan did well in the cook-off that day and went on to win more, including entry to the Ultimate Recipe Showdown. Now as you know by now, these bars did not win the category. The judges liked the flavor, but subtracted points because they didn’t like the gritty feel of the filling. After making them, I agree that the grittiness is noticeable, but the bars are still very good. They cut beautifully and have a wonderful flavor. As for the grittiness I might play around a bit with the brown sugar mixture. I think maybe cutting the sugar in the filling to 1/2 cup would help. The salted pecan topping was excellent and necessary to curb the sweetness. I’m glad I went to the gym because I couldn’t stop eating them. If you can’t find roasted, salted pecans (I couldn’t….and was aggravated) you can make your own. Here’s a link to the recipe in case you missed the first one. Sandie, thanks for posting. Texas Sheet Cake, if I recall, is a lot like Coca Cola cake but with more chocolate and less sweetness. This looks like a good one. I’ll make sure Chris sees it. 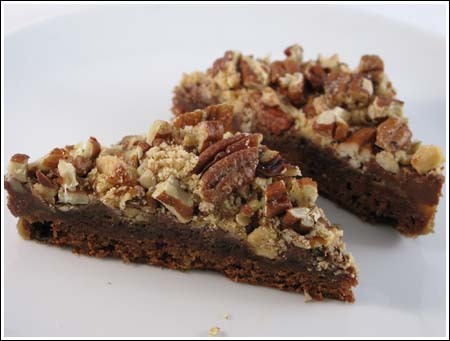 Texas Sheet Cake – I wouldn’t say it was really chocolaty – not anywhere near a devils food cake. It is different – a medium chocolate flavor. I make this cake 4-5 times a year. I received this recipe from my mother-in-law many years ago. I do not know where she got it from. It is delicious and simple to make with ingredients most people have on hard. But…if you do not like surgary, sweet cakes – don’t bother making it! The frosting is VERY sweet, the cake is very moist becaue the heat of the frosting seeps into the cake. Great warm or room temperature with a scoop of vanilla frosting to cut the sweetness. Spray a 17×11 inch baking pan (jelly roll pan) with non-stick spray (line with parchment paper if desired and spray again). Set aside. Using a wire whisk, combine the flour and sugar in a large mixing bowl. In a medium sized saucepan, melt the butter and shortening, over medium heat. Add the coffee and cocoa powder stirring them in with a wire whisk. Bring to a boil. Pour this boiling mixture over the flour and sugar. Mix gently with the whisk. Add the buttermilk, eggs, baking soda and the eggs. Mix until the dry ingredients are wet – about 1 minute. Pour this mixture into the prepared jelly roll pan. Bake for approximately 15-20 minutes. Check at 15 minutes. When a toothpick inserted in the middle is removed, some crumbs should stick to it. Don’t overbake. While the cake is baking make the frosting. It should be warm and ready to pour the minute the cake is removed from the oven. So start cooking the frosting when the cake is about 5 minutes from being done. In a medium saucepan over low heat, melt the butter. Once melted, stir in the buttermilk and then the cocoa powder. Continue heating, but increase temperature to medium and bring the mixture to a boil. Remove from heat and stir in the powdered sugar and vanilla until no lumps remain. The frosting will be thin. If it cools too much it will form a skin. Just stir it prior to pouring over the cake. When the cake is done, pour the warm frosting over it and quickly smooth it with an offset spatula. Let cool to room temperature. Cut into squares – size your choice. You may want to add a pinch of salt to both the cake and frosting if using unsalted butter. I have made it with both types of butter and can’t tell the difference – your choice! You can also substitute heavy cream or whole milk for the buttermilk in the frosting. I just prefer using up the buttermilk. On occasion I have been out of the buttermilk and used the standard substitution of 2 tsp vinegar with 1/2 cup whole milk – it is noticebly different. It doesn’t taste as rich for some reason. You can also make this in a 13x9x2 metal baking pan following the same instructions. It just makes a thicker cake and frosting layer. Cook approximately 5-10 minutes longer. I’d be interested in the feedback that you’ve received on the chocolate cake from URS, too. Also — do you have a tried-and-true for Texas Sheet Cake? For some reason, I’ve been obsessed with the idea of making one — even though I’ve never had it before! I’m convinced that it must be over-the-top in the chocolate deparatment?? :)! I can see how that would happen. The Oaxaca Bars were not as good on Day 2, so unless you took them to work the first day you baked them, they wouldn’t be as good. Now I am worried about what you are going to do with the chipotle powder and espresso powder. LOL. Too bad you don’t live nearby, or I’d come over to your house and by them from you. I was worried about the pinapple bars, but if Therese says they’re good, they’re good. They do sound quite sweet. There’s a recipe in the Wellesley Cookie Exchange book that is similar but has way, way, less sugar and no white chips. Ultimate Recipe Showdown: I tried the Oaxaca Fudge Bars with Cashew-Crumb Topping. The recipe sounded so good, it looked good on TV, and the judge’s comments made me think they would be wonderful. Ick… Not just my opinion. I made them for a meeting at work. Not one person liked them! Their comments: too bland; it would be better with peanuts or macadamia nuts instead of cashews; they were flat tasting – not very chocolaty; they didn’t taste like a cookie or brownie; and a “no winner” Sandie, don’t bother with making them again. Needless to say I was very disappointed on the taste and spending the money on the special ingredients – chipotle chili powder, espresso powder and the expensive Valrhona chocolate – not ingredients I keep in my pantry – nor will need anytime soon. Based on the quality of what I have made so far, it motivated me to check out entering the next URS – but unfortunately I missed the deadline. Thanks for offering the opportunity of us to comment on your website. I appreciated being able to read what others experience in their baking. Based on the comments above about the pineapple macadamia bars – I will try them and hope for the best! I’ve gotten some feedback on the winning cake. I’ll send it via email. Thanks for the pineapple bar report. I think the judges must have had to be very, very picky just to determine the winner….which is a good thing. All of the finalists, technically, should be very good, seeing as how they beat all those other people just to get into the contest. Eyes are better. I have dry eye and she told me what to use — Systane and Omega 3’s. I am putting hempseed oil, which is loaded with Omega 3’s, on my salad. I’m also going to get some flax oil. Thanks for sharing that experience at the ultimate cookie challenge. I made the pineapple macadamia bars off that same contest(they didn’t win either)…but, they were amazing! My family really liked them and they were really easy to make! These look great too! Has anyone made the winner on the ultimate cake challenge (chocolate layer cake)??? I am in charge of bringing a birthday cake for a party on Sunday…help!! Any ideas? How are your eyes by the way? Chris, if you find one, let me know. I thought about making one for Easter but got kind of overwhelmed with the search. Romina, they are very good. In fact, they are even better now that they’ve chilled for a while. Anyone out there in Cookie Madness Land have a good recipe for German Chocolate Cake and Frosting? I want to make one for an event on Friday. I can get loads of recipes online or from Betty Crocker, but if someone has a tried and true tested recipe, I’d be interested in seeing it.